This is a very effective home remedy for spotless and glowing skin. 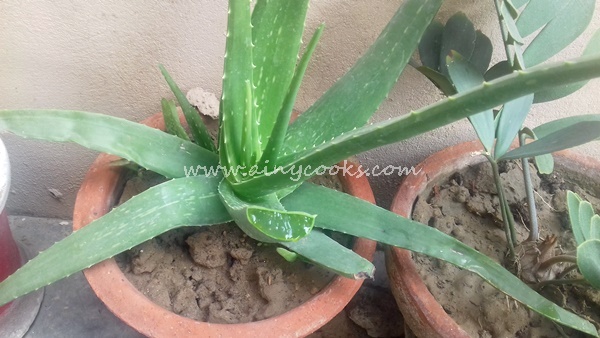 Aloe Vera is very useful for our skin and health. This treatment will cleanse, scrub, tone and nourish your skin. Aloe vera is rich in Vitamin C and beta carotene which gives your face and skin nourishing and anti ageing qualities. It can nourish your skin without making it greasy. Aloe Vera helps to heal your skin with sun damage and it acts as a protective layer on the skin and helps to re nourish your skin. Because of its nutritional qualities and antioxidant properties, the skin heals quickly. 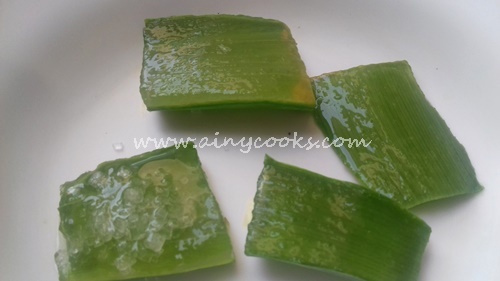 Take Aloe Vera leaf. I have this plant in my garden. You can grow plant in container and get fresh gel whenever you need. Now follow these steps for skin treatment. Cut leaf into four parts. Cut sides of leaf, it contain small spikes. Cut from center. You can use store brought gel as well. Now you have 4 pieces, one is for cleansing, second is for scrubbing, third is for toning and fourth is for moisturizing. Sprinkle rice flour or granulated sugar on one piece. This is for scrubbing. Extract gel from one piece and transfer it in a small bowl. Mix add 2tsp rose water in it, 2 tsp mineral water or use normal boiled water. Mix all well and fill in a spray bottle. You can store it in refrigerator for 6-7 days but shake well before use. Wash and towel dry your face. Rub one piece on your face. This is cleansing. Rub in circular motion. This natural moisturizer will nourish and hydrate your skin and enhance elasticity. Wipe your face with a wet tissue or wet cotton ball. Now take piece which you have prepared for scrubbing. Scrub this piece on your face for 1-2 minutes in circular motion. 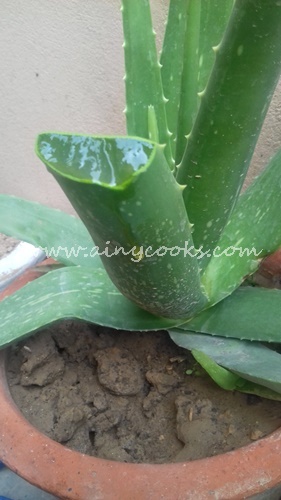 Aloe Vera is effective for Acne and scars as well. Wash your face and towel dry it. Apply toner on your face and let it dry. Now apply fourth piece on face. And let it dry completely and wash your face. Do cleansing, toning and moisturizing daily , 10-15 days But do scrub twice weekly. You will feel difference in a week. Your skin will start glowing.